This quick and easy bowl of spaghetti is topped with crisp and salty Parma Ham, the perfect way to end the day. I don’t think I’ve ever come across an Italian dish I didn’t love. From creamy mushrooms on polenta to classic lasagne, tiramisu and cannoli. Heck, I even love to wash it all down with a cheeky Aperol Spritz. There are a number of things which I think help make Italian one of my favourite cuisines: simple recipes, made to share with quality ingredients. It can be hard to recreate good Italian food at home if you’re missing the latter! I’m lucky that across London there are tonnes of good delicatessen’s stocking the best possible ingredients. I’ve spoken at length on this blog about the fantastic Greek and Turkish deli’s in North London but for Italian produce it’s got to be Antonio Delicatessen in Lewisham. It is absolutely piled high with pasta, pulses, sauces, cheese and so much more. You will find almost all of the ingredients for this recipe at Antonio’s. Check out my full review of Antonio Delicatessen, winner of the 107 Parma Ham Specilist Deli of the Year, here. When you’re cooking an Italian recipe like this, you’ve got to seek out the best ingredients. Whether it’s using cherry tomatoes still on the vine, or the freshest of pasta it makes all the difference if you spend a little extra on quality. You definitely get brownie point from me if you grow your own tomatoes or make your own fresh pasta, but you might find it a little more tricky to make Parma Ham yourself! Luckily you don’t have to as the Prosciutto di Parma consortium (aka Consorzio del Prosciutto di Parma) include a long list of trusted Prosciutto di Parma specialists on their website. If you buy from any of the specialists on the list, including Antonio, you are guaranteed to be buying a top quality product from someone who knows what they are talking about. 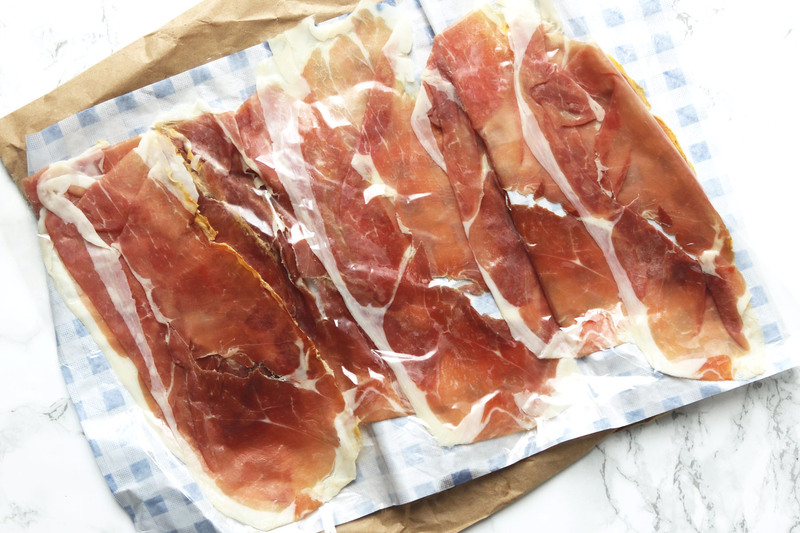 When I bought my Parma Ham from Antonio’s I did a taste test with a pack purchased from a supermarket – it was as though I was eating two completely different types of ham! You might be wondering why I’ve used Parma Ham in this recipe rather than another form of cured ham or even bacon. But Parma Ham really is the king of all hams, that’s why all Parma Ham carries the five point Ducal Crown firebrand . If its got the crown you can guarantee its been made properly from one of three breeds of pigs, bred in one of ten northern and central Italian regions. There are just four ingredients that go in to Parma Ham – all natural I might add! They are pork, salt, air and time. I love making whatever I can from scratch but sadly that third ingredient has to come from the Parma region, and I’m not planning a trip any time soon. I love how a thin slither of Parma Ham just melts lazily on your tongue. The fat has a creamy nature which balances beautifully with the salt used in the curing process. People often get their first taste of Parma Ham uncooked and unadulterated. For this recipe I may have cooked the Parma Ham and mixed it with a few extra ingredients but I promise it is still the star of the show. Enough about the Parma Ham – for this dish you’ll also need fresh spaghetti (if you’re feeling ambitious you can get my recipe here) as well as cherry tomatoes (preferably still on the vine), fresh parsley (find out about growing your own here) and a jar of roasted sweet chilli peppers (make sure you pick them up at the same time as the Parma Ham when you head to Antonio’s). Thinly slice the Parma Ham until you have thin strips. Spray a frying pan with a little olive oil and add the Parma Ham. Fry on a medium heat until the fat starts to render and the Parma Ham becomes crispy. Place the Parma Ham to one side. Slice the onion into thin strips and add to the pan of olive oil and Parma Ham fat along with a pinch of salt. Cook on a medium heat for 5-10 minutes or until the onions are soft. Thinly slice the peppers and halve the cherry tomatoes before adding to the frying pan along with the minced garlic and a little more olive oil. Cook for 5 minutes, stirring occasionally while you boil a pan of water for the pasta. Cook the pasta for 5 minutes (as per the packets instructions). Drain the pasta, keeping a few tablespoons of the pasta water back. Add the pasta to the frying pan along with the vegetables and toss until well combined. Stir through most of the parsley along with salt and pepper to taste and most of the grated Parmigiano Reggiano. Top with the crispy Parma Ham and the remaining parsley and Parmigiano Reggiano and serve! Oh I do agree. Italian food is one of my favourites too. Simple peasant food made with fresh seasonal ingredients – what could be better? Me too on Italian food, when cooked with good quality ingredients, it’s an absolute wonder! Love the look of this pasta recipe! Peppers and cherry tomatoes make the perfect sweet and flavourful sauce for spaghetti. Nice idea! A unique take on the parma, love it! I love italian food also – you said mushrooms and polenta and I drooled a little bit. Prosciutto is one of my all time favorite meats, I wish I could make it at home! Sound like a great dish! I am with you–I have NEVER come across an Italian dish I didn’t love. I have been looking for new pasta dishes and this is it! Looks like such a hearty meal! So simple, yet so flavorful! My daughter loves Italian food and she would be all over this delicious dish! I love your use of Parma Ham in this! What a perfect simple but delicious Italian supper for weeknight evenings – my husband is a big Parma ham fan and would adore this. Hadn’t seen your new blog logo before, the bus is awesome – love it!